On a trip to pick up tickets at the Kennedy Center, I discovered the Artes de Cuba: From the Island to the World. For those unfamiliar with the Kennedy Center, the theater along the Potomac River is one of several arts meccas in the Washington D.C. area. It’s usually know by its plays (‘Hamilton’, I’m looking at you) in June and musical offerings, but right now it has sculptures on the main floor, and an extended video and costume exhibit on the terrace level, next to the restaurant. The outer room has a 15 minute video of Cuba’s vibrant buildings from Emilio Perez, but the most stunning part in the inner room are costumes by Cuban artist Celia Ledon. ‘The Shining’ is made from pop-top rings crocheted together and tied with strips of lycra. 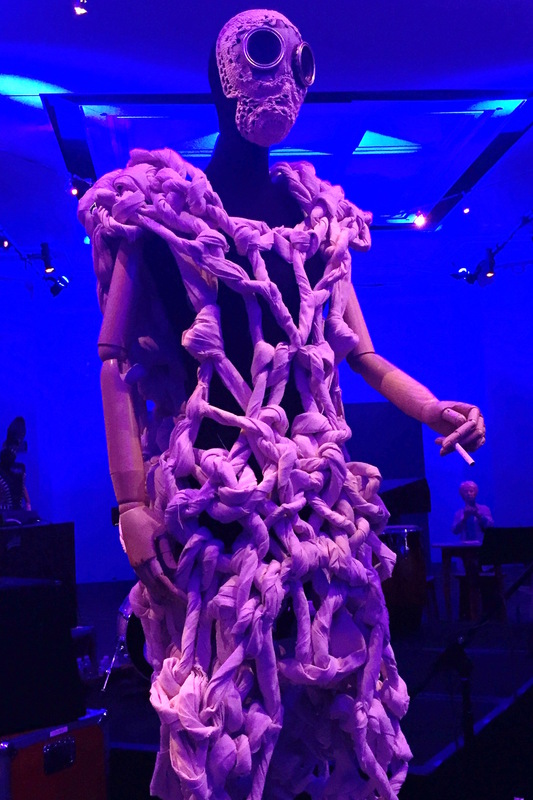 Her intricate costumes come from “discarded videotapes, pop-top rings and tires”. According to the wall information, she is “obsessed by trash.” With unusual articulated mannequins, her work looks like it comes from science fiction films. In fact, her work has appeared feature films and fashion. At this moment she’s working with the Teatro el Publico Teatro el Publico and Ludi Teatro, whose U.S. premiere was canceled in October 2017 after visa difficulties. The exhibit is lit with blue light and neon. I converted one of the pictures to black and white so the detail can be seen. “Photo Sensitive” by Celia Ledon. The photo was converted to black and white so detail could be seen. The Artes de Cuba runs until May 20, 2018. A pop-up store on the main level of the Center sells bright, Caribbean-patterned scarves and wraps. A crocheted gas mask tops “Loose Ends” from Celia Ledon. It’s made of raw canvas. This entry was posted in 2018, art, Costume, Uncategorized and tagged art, Costume, Cuba. Bookmark the permalink.